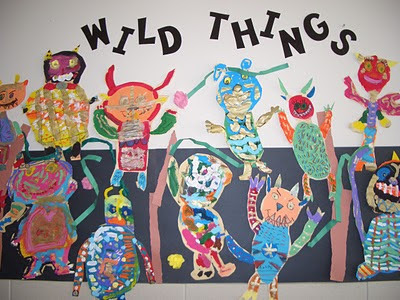 Wild Things created by first grade students. Inspired by the story "Where the Wild Things Are" by Maurice Sendak. The students first drew their image on 12 x 18 drawing paper then painted a base coat. The second class visual texture was added using pastels. Seeing these in the hallway at school is wonderful. We are blessed to have Mrs. Rink turn our building into an art museum! What an incredible self esteem builder for children, to see their art work displayed for all to see.